For those of us in the New York metropolitan area who discovered FM rock music in the 60s, WNEW-FM is the station we think of. Yes, WOR-FM had preceded ‘NEW with a rock format and later there was WPLJ-FM where John Zacherle and Vin Scelsa initially were. But WNEW-FM really was where rock and our hearts lived. And Alison Steele became one of those voices forever embedded in our hearts. 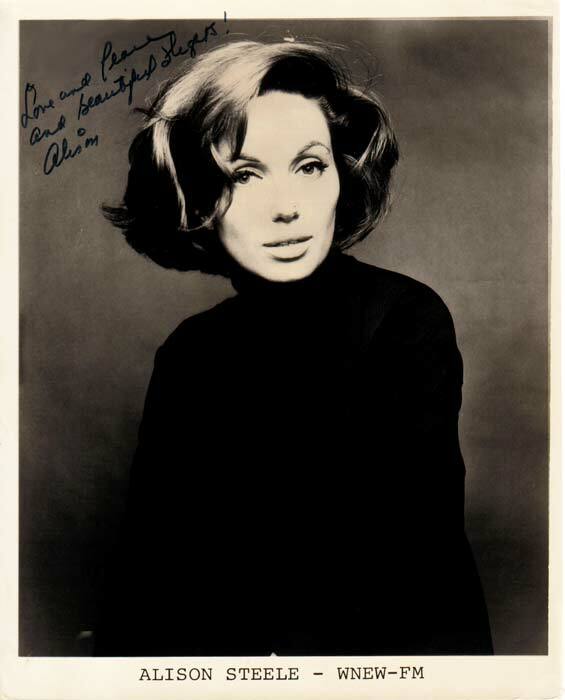 She began her time at ‘NEW in 1966 as part of an all female DJ line-up. An interesting legal adjustment WNEW made since FM stations in large markets could no longer simulcast what was being broadcast on the AM side. The experiment lasted 13 months. 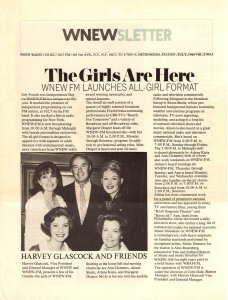 WNEW-FM newsletter from July 1966. The station launched an all female DJ line-up. Alison Steele was one of that group. 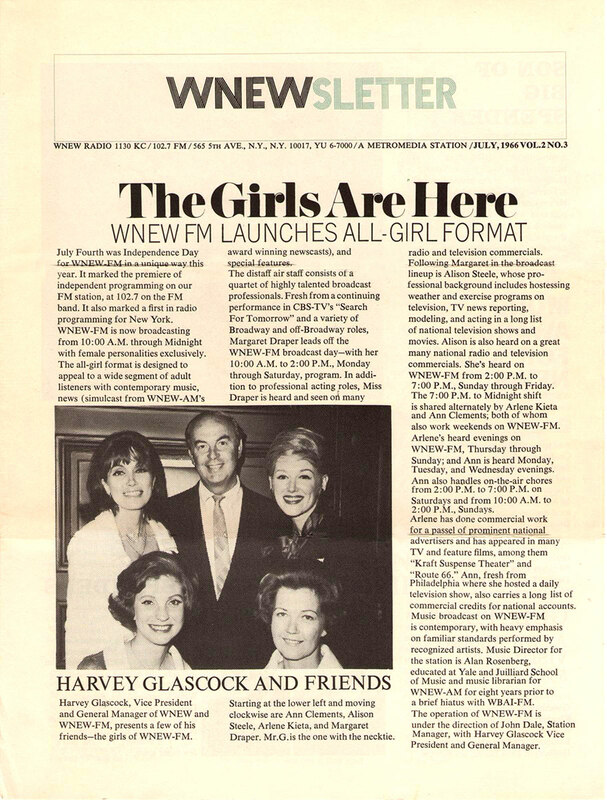 The wonder and beauty of WNEW-FM’s format was that the DJ’s were far more than disc jockeys. While certainly playing music–vinyl and likely albums–they also spoke to us. They commented on current events. They read poetry. They told stories. 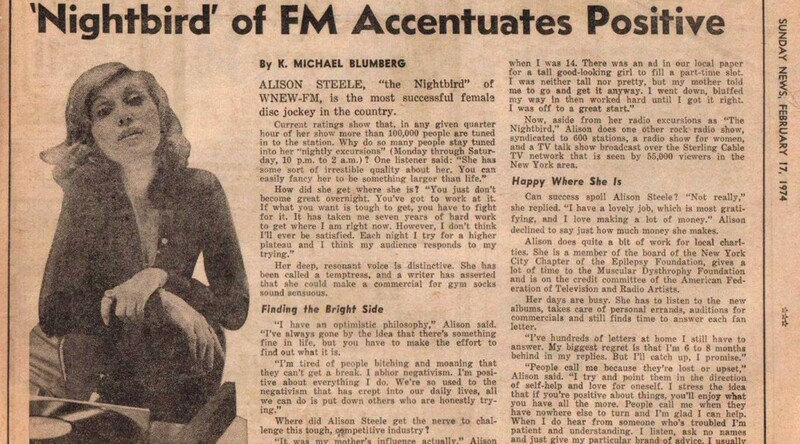 She left WNEW in 1979, but her voice continued to be her presence.